In the recent filing November 9, 2011 of an Ohio case, Deutsche v. Holden, in the Court of Common Pleas in Summit County, (Akron) Ohio, defense attorneys submit that the note had not been transferred pursuant to the PSA therefore the foreclosing entity (Deutsche) did not own the note and mortgage. Holden‘s Motion to dismiss cites the November 16, 2010 Congressional Oversight Panel’s (COP) report titled “Examining the Consequences of Mortgage Irregularities for Financial Stability and Foreclosure Mitigation” as well as the PSA and New York trust law. Like most of the mortgage loan documents-to-trust manipulation, Holden’s assignment is 5 years too late. The REMIC has failed. Hopefully, Judge Cosgrove will mount the stallion of integrity and ride through Akron alerting the good folks of Summit County that Governments can no longer tolerate the use of misrepresentation, opaque, and confusing language in drafting, maintaining and executing financial instruments. Clarity and precision are indispensable for the creation of credit and capital through paper. The foreclosure shall therefore be dismissed with prejudice. Politicians must not forget what their greatest thinkers have been saying for centuries: All obligations and commitments that stick are derived from words recorded on paper with great precision. Above all, governments should stop clinging to the hope that the existing market will eventually sort things out. “Let the market do its work” has come to mean, “let the shadow economy do its work.” But modern markets only work if the paper is reliable. All documents and the assets and transactions they represent or are derived from must be recorded in publicly accessible registries. It is only by recording and continually updating such factual knowledge that we can detect the kind of overly creative financial and contractual instruments that plunged us into this recession. Governments can also tighten and increase the penalties. You lie, misrepresent, mislead, commit fraud, aid & abet, fail to inspect and perform significant due diligence – you pay steep fines AND go to jail. Period. You fail to report or blow the whistle – you are an accomplice, you too pay fines and go to jail. Mortgage-backed securities were KNOWN in the industry to have inflated property appraisals, systematically abandoned underwriting guidelines and over-rated bonds. These material misrepresentations were unknown to the borrowers and to the actual investors, the workers whose retirement and pension funds were gambled away. Broaden the securities laws to enable borrowers, whose collateral was inflated and used to bait investors, to file suit against the culprits for fraud. “Government’s main duty now is to bring the whole toxic environment under the rule of law where it will be subject to enforcement. No economic activity based on the public trust should be allowed to operate outside the general principles of property law. Financial institutions will have to serve society and fully report what they own and what they owe — just like the rest of us — so that we get the facts necessary to find our way out of the current maze.” (quoted from Hernando de Soto 2009). Government can, and by all means should, regulate derivatives. Frankly, it’s not likely Americans (or the rest of the world for that matter) would even wince if a prison were to be built in the Marshall Islands and these banksters hauled off for 5-10 years. It certainly didn’t work to de-regulate them. 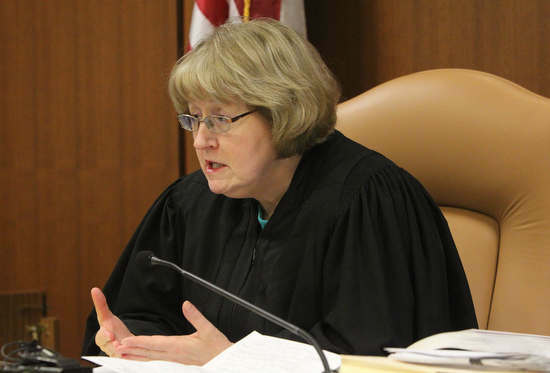 Judge Patricia Cosgrove was a signatory on a Judicial Order (May 1, 2008), along with 7 other Judges, requiring that all Plaintiffs filing for foreclosure judgements present with their filing a Certificate of Readiness. The Certificate of Readiness outlines the documents required to prove that the Plaintiff is the real party of interest and that the Plaintiff has legitimate documentation to support that claim. This entry was posted in Banking, corruption and tagged Congressional Oversight Panel, falsified documents, foreclosure fraud, Ohio Judges, REMIC. Bookmark the permalink.